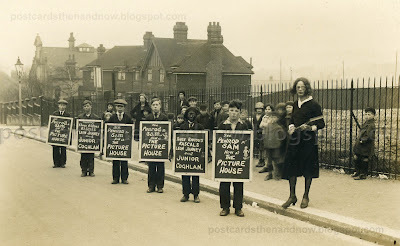 Chatham, Kent, Film Promotion Postcards c1931. This is a postcard showing a promotion for the 1931 film 'The Champ' starring Wallace Beery and Jackie Cooper, which was showing at the Picture House, Chatham. It was taken just next to Chatham railway station. 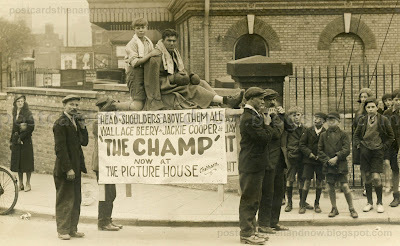 Obviously, that's not the real Wallace Beery and Jackie Cooper being carried aloft. The men doing the carrying don't seem to be too pleased. Below the Google Street View showing Chatham station today is another postcard from Chatham, this time promoting the 1931 film 'Penrod and Sam', starring Leon Janne and Frank Coghlan Jr. I haven't managed to find the location of this one on Google Street View, perhaps an eagle-eyed reader can assist. For more old pictures visit this week's Sepia Saturday blog. Click the postcards to enlarge. The lady in the last picture looks like she is going to hit these sandwich boys any time now. And the boy on the very right has this not-in-a-lifetime-look/attitude. The fellows in the first photo are probably grumpy about having to stand there carrying that weight while someone takes the picture. They probably would prefer to get on with it and get paid.... The second photo is interesting. One of the kids got to wear blackface, I see. The kid leaning against the fence on the far right looks unimpressed with his schoolmates! Thanks for showing us these! Is the lady in the second picture a school mistress slapping a cane (cosh)or slipper in her hand. I'm wondering about that woman too. Those sandwich boards probably afforded a little protection against the likes of her. Yes - that last picture poses quite a few questions! 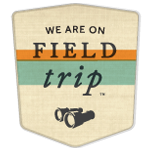 Enjoyed your post! What a great way to promote a film or any kind of show, although it wouldn't be very effective today. These are both fantastic cards. A clever link to the theme and, as always, some fascinating views - old and new. What a great subject for postcards. I'm wondering whether those are one of a kind or ones that were produced for sale. I also wonder whether films were promoted that way in the U.S.
Did you find this archive, Howard? I was curious if the Picture House cinema has survived, so I looked it up and found this website. 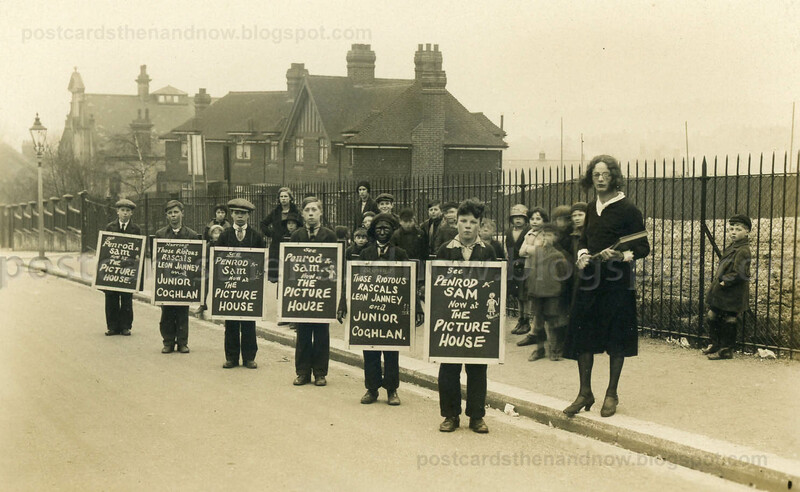 There are more than a dozen promotional photos of the Picture House, many with the same placard bearers I think, and certainly by the same photographer. I took a "stroll" down the High St but couldn't find the theater. A very interesting area and super postcards. OK I found both postcards in this collection. Here is the description for the second card with the location. Notice that it says that it was no woman but a man standing by the boys! The Picture House, High Street, Chatham. Well spotted Mike. I hadn't seen these cards at the cityark.medway site. They have some great material there. I'm guessing the two actors being carried aloft were probably big hits in the town for a few days even if they weren't in the film. Very interesting postcards! I didn't know they used to promote films via postcards. What. that woman is really a man, not a female school teacher? Great post. Imagine trying to advertise a film like that today. Well, I guess it could be a man. How interesting. I'm glad I checked back.